Fuzhuan Cha is one of the most renowned Hunan Dark Tea. Before the introduction of Fuzhuan Cha, it is necessary to have a background knowledge of Chinese Dark Tea. Dark Tea is a type of post-fermented tea. The fermentation of Dark Tea is different from those of Black Tea and Oolong tea. We call Black Tea as full-fermented tea and Oolong Tea as semi-fermented tea. 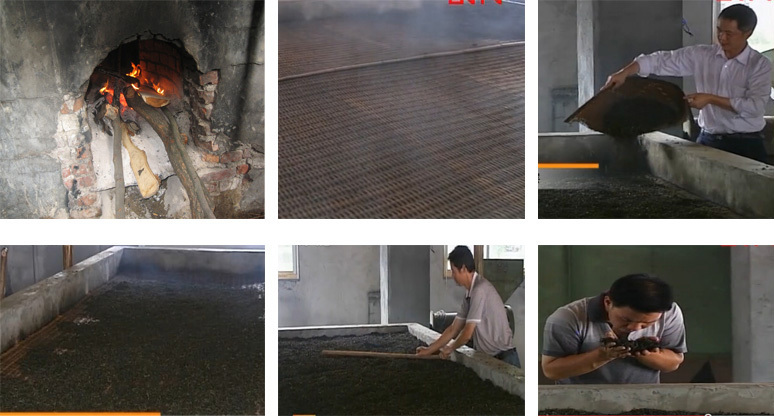 The nature of the fermentation of Black Tea and Oolong Tea is reaction of the biochemical compositions in tea leaves under oxygen surroundings. While the post-fermentation of Dark Tea is biochemical compositions change with the intervention of micro-organisms. Generally The fermentation of Black Tea and Oolong tea is done in a few hours. While the post-fermentation of Dark Tea will go on after the product is made and will last very long time for a few months or a few years. Dark tea had been invented in China long time ago. 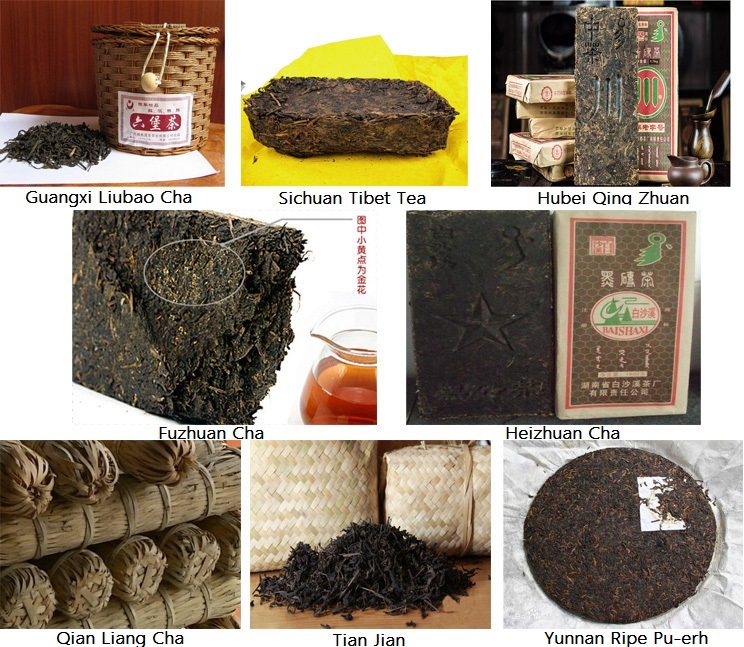 There are are few types of Dark Tea from several provinces. 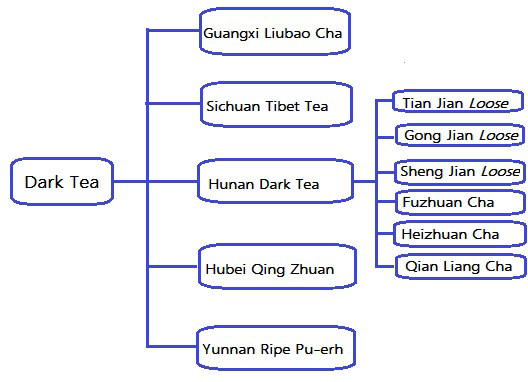 The following is a family tree of Chinese Dark Tea. Among them, Hunan Dark Tea is one of the most important types, and Fuzhuan Cha is the most distinctive Hunan Dark Tea. The origin of Hunan Dark Tea-Fuzhuan Cha has close relation with Chinese North and West territory nomadic nationalities.Nowadays they are Mongolian, Tibetans and Uigurs. etc. These peoples’ general diet is mainly composed by meat, milk and bread. It lacks vegetative and fiber foods. So they need tea to digest oil, and help supply fiber, vitamins and minerals. Tea is the necessity of their daily life. As one story tells they can stand three days without any food, while they can not stand one day without tea. The tea trade with Chinese bordering nationalities began in middle Tang Dynasty (618-907AD). 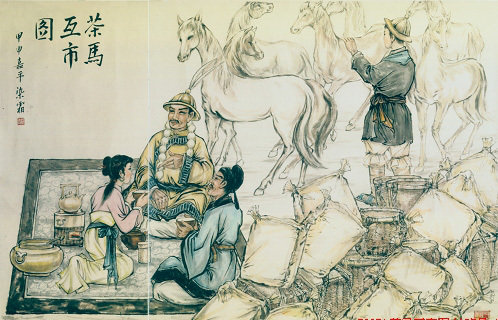 In Song Dynasty (960-1279AD), the central empire had set up official department to manage the Tea and Horse Market (茶马互市) with the North and West bordering nationalities. Tea is the strategic materials using to control those sometime friendly and sometime hostile nationalities. One one side the tea can exchange horses to equip the army, on the other side the central empire would close the market as a kind of punishment when they became hostile. The bordering sales tea was collected from the South provinces. And Hunan was one of the biggest producing provinces. 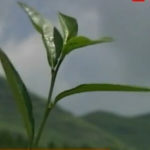 In the ancient times, the bordering sales tea was Chinese traditional green tea. And the main transportation to the faraway North and West territory is horse. For the sake of transportation convenience, the tea was tightly packed to be loaded on the horse back. 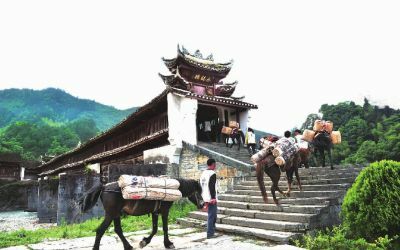 Generally the journey from the departure to the destination Tea and Horse market would take several months and it would encounter each kind of weather conditions. Though the tea was well packed, the ancient natural packing materials (mainly bamboo cage, palm coat and Indicalamus leaf ) could not completely isolate moisture, sunlight and other natural factors. The quality of tea would often change after arriving in the destinations. Unexpectedly the quality change was very well accepted by the nomadic consumers. The change was actually a kind of post-fermentation which made the tea quality better. Later to ensure the tea would properly change to the favorite quality, the tea was imitatively processed in the producing place to achieve the post-fermentation effect as per quality change brought by the natural conditions of the long journey on horse back. So Hunan Dark Tea was invented. 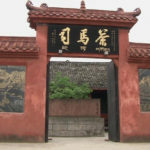 The invention time might be middle of Ming Dynasty (1368-1644AD) according to the documentary. 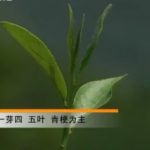 Later onwards, the Hunan Dark Tea evolved into several types, namely Heizhuan Cha, Qian Liang Cha, Fuzhuan Cha, Tian Jian, Gong Jian and Sheng Jian. The main producing place of Hunan Dark Tea is Anhua County. Anhua County is located in the Wuling Mountains area of central west Hunan Province. It is covered by deep forestry and has the world unique tillite rocks formed by the glacier around six hundred million years ago. 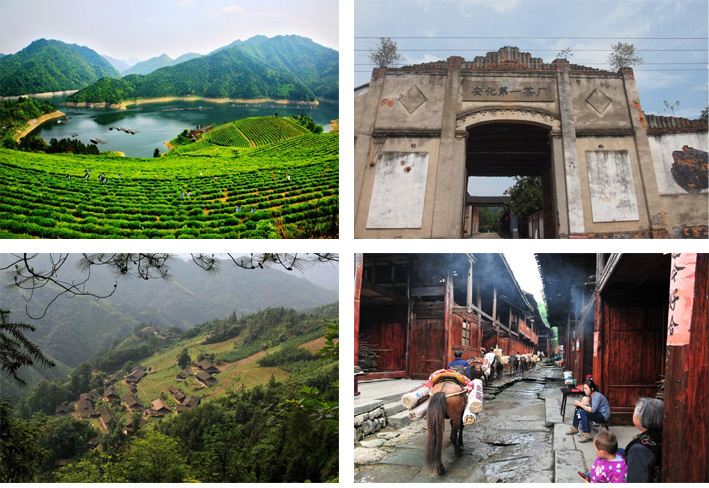 The special growing surroundings of Anhua endows the tea with talented nature to make good quality tea in history. Fuzhuan Cha is the most distinctive Dark Tea produced in Anhua. The name of it come from that the producing time of Fuzhuan Cha was in Summer of each year. Summer in Chinese is ‘Fu’. So it was named. The good nature Anhua tea material and the ingenious processing of Fuzhuan Cha not only make it behave outstanding tea quality but also produce a kind of fungi which is very beneficial to Human health. This fungi Eurotium cristatum is called as Jinhua by Chinese, which means Golden flower in English. This golden flower is as precious as the Chinese Ganoderma. Eurotium cristatum itself can inhibit the growth of bacteria and many kinds of other fungi. 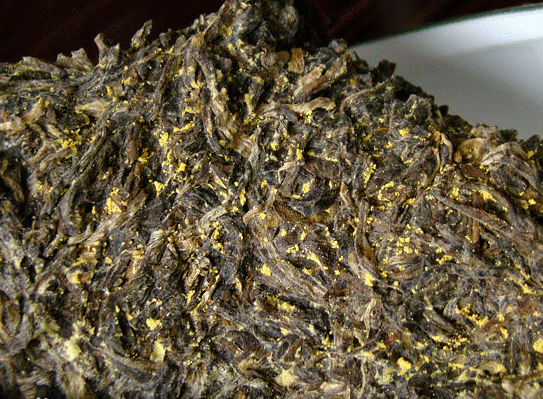 In Fuzhuan Cha, Golden flower is the exclusive fungi which grows. It can significantly helps digest, lower blood fat and blood sugar and regulate metabolism. Eurotium cristatumcan also improve the tea quality in that It helps transform monosaccharide and promote the oxidation of tea polyphenols. Consequently the coarse flavor in tea was eliminated and the taste become more smooth and sweet. The tea brewing turn out to be wine red color. One interesting story is that in the past China had practiced planned economy for around forty years. In that times, the Fuzhuan Cha was produced and specially supplied to Northwest minorities, especially to the Xinjiang Uygur People. It had not ever been sold in inland provinces. Later, a study found that there were significantly less cases of high blood fat and high blood sugar among the Xinjiang Uygur People as contrast with inland Han Chinese, despite that the Xinjiang Uygur People has more meat intake. 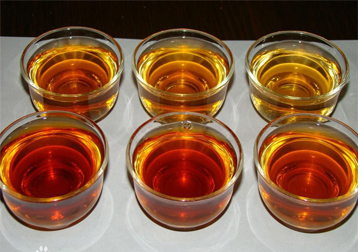 The research result showed that the difference was mainly brought by Fuzhuan Cha’s consumption. 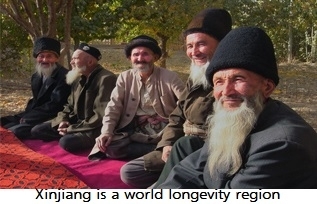 Xinjiang is also one of the four longevity regions in the world. It has quite high percentage of old people aged more than one hundreds years. The Fuzhuan Cha’s great value to human health was discovered by neighboring Japanese in 1980s. They have kept studying its health function for tens of years. There are more and more health reports by Japanese. As the people in the world most longevity country, Fuzhuan Cha is widely accepted by Japanese. Now Japan is the biggest Fuzhuan Cha importing country. Generally Fuzhuan Cha has the following health functions. 1 Supply Vitamins, Minerals and Fiber, especially helpful to those whose diet is mainly meat and lacks of vegetative source. 2 Aid digestion and nourish the stomach. It can enhance the secretion of gastric juice, intestinal juice and bile. Enough gastric juice and intestinal juice is necessary for food digestion and alleviate the burden of stomach. And bile will decompose oil efficiently. 3 Lower fat, keep body slim. The tea polyphenols can inhibit the activity of FAS (fatty acid synthetase), thus lower the fat synthesis in human body. And the Eurotium cristatum can secrete enzymes to decompose fat. 4 Anti-aging the antioxidants in tea can eliminate free radicals in human body. Free radicals are critical to human aging according to the latest scientific research. 5 Anti-tumor The tea polyphenols can inhibit the matastasis of tumor cells. And Dark Tea contains rich Selenium element which plays important role in the prevention of tumor. 6 Anti-hypertension Theanine can activate dopamine nuerons thus control the blood pressure. And tea caffeine and EGCGs can soften blood vessels. 7 Lower blood sugar tea polysacharide can regulate blood sugar metabolism and lower blood sugar. Post-fermentation Dark Tea has higher content of tea polysacharide than other types of tea. It is the most effective tea to lower blood sugar. 8 Anti-inflammation Theaflavins and tea saponin can inhibit bacteria and certain fungi. And tea saponin is widely used as biological pesticide and pond water cleaner. 9 Antidote Tea caffeine would enhance the function of bladder. Urine would take out toxins from the body. Tea polyphenols could not only deposit nicotine to reduce the harm of smoke, but also absorb heavy metals in human body. The plucking standard of Fuzhuan Cha-Hunan Dark Tea requires a bit old tea leaves. The material can not be too tender below one bud two leaves. Generally it will be one bud three to six leaves. And long stalk is necessary to make Fuzhuan Cha. The plucking timing is end of Spring and begining of Summer. Because the material is not tender, it contains relatively lower water content. it does not require special withering handling before the frying. 1 Frying the traditional frying of Fuzhuan Cha is conducted in big thick iron pan and heat up by wooden fire. 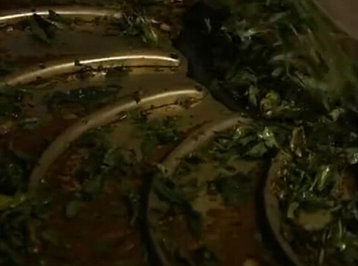 It need high temperature to fry the old coarse tea leaves. The quantity to be fried in the pan is much more than that of green tea. When the tea leaves become soft and sticky, the color turn to dark greenish and the grassy flavor change to fragrant flavor, the frying is enough. 2 Primary Rolling Fuzhuan cha need conduct rolling for two times. This is the first time rolling. It is conducted in the rolling machine immediately after the Frying when the tea leaves are still hot and sticky soft. Rolling will shape the tea body. 3 Pile Fermentation is the most critical processing in forming the quality (flavor, taste and color) of Fuzhuan cha and other Dark Teas. 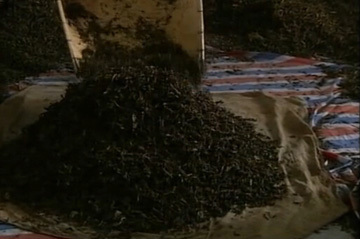 The tea leaves after rolling is put in a big pile under a covering. 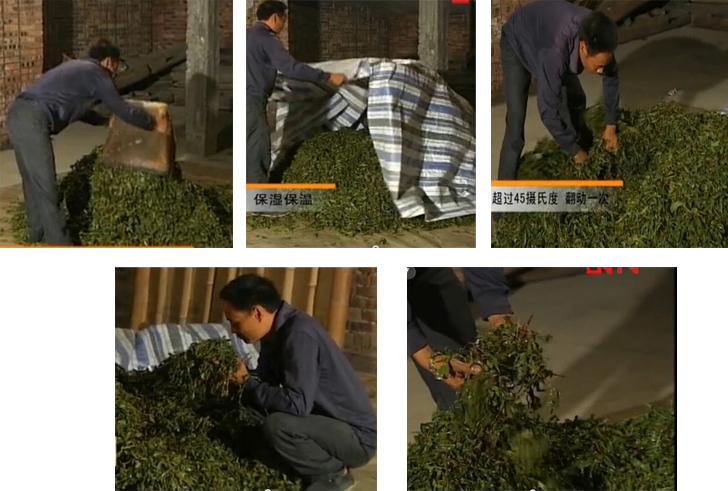 Moisture content of tea leaves is very important of the pile fermentation. Neither it can be too high, nor too low. The temperature will go up and then drop down during piling. And it will need stir one time to avoid producing too high temperature inside the core of the pile. The pile fermentation will last around 12-24 hours depending on the actual surroundings temperature and relative humidity. In the final stage of the processing, the tea leaves will turn to yellowish brown color,they are not so sticky as before and they will give off a kind of maturing alcohol flavor. Then the pile fermentation will finish. 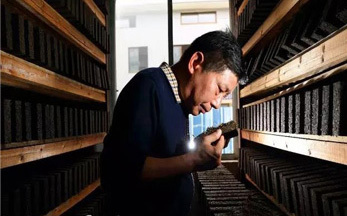 It is generally believed that in the upper part of the pile fermentation the hydrothermal effect plays the role of forming the Fuzhuan cha quality, while in the later part of pile fermentation micro-organisms will be engaged to form the quality. 4 Re-rolling is conducted similarly to Primary Rolling. But Re-Rolling will be less intensively conducted as compared to Primary Rolling. It will further shape the tea body. 5 Baking is one of the other critical processings of Fuzhuan Cha. 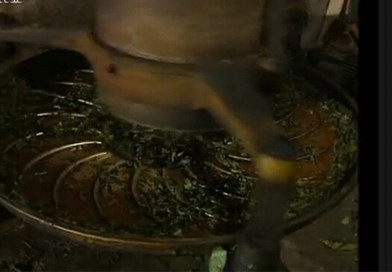 Traditionally the baking is conducted on a special stove called as Qi Xing Zao. This is a big stove. It is built by brick and cement. Wooden fire is burning under the square surface, and the after Re-rolling tea is put on the bamboo bed for baking. Smoke is not avoided during the baking (which is unlike most of the green teas and oolong teas in that smoke is definitely prohibited during the baking processing of them). 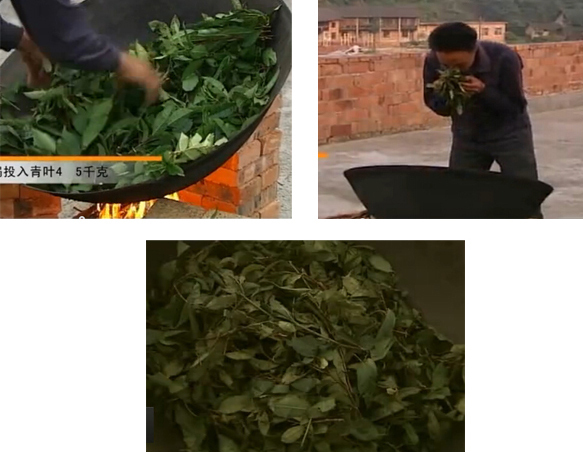 To achieve nice flavor, Fuzhuan Cha specially needs burn pine wooden to heat up the stove. The traditional Fuzhuan Cha and Hunan Dark Tea has the special fragrant pine smoke flavor. When the tea leaves become easy to press into powder by fingers, and the stalk become crispy to be easily break down, the baking will finish. 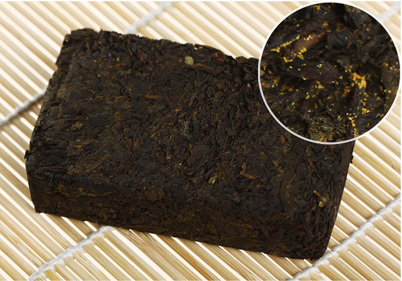 The well-baked Fuzhuan Cha-Hunan Dark Tea is featured by nice pine smoky flavor and the tea body is bright black color. The after baking tea contains around 8% water content. It is semi-finished tea product called as Hei Mao Cha. 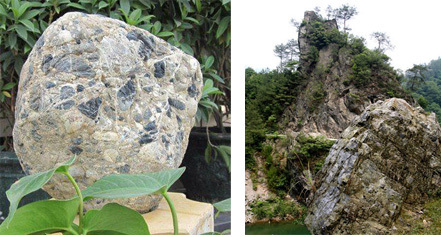 It is the rough material which can be further processed into Fuzhuan cha, Hei Zhuan Cha and Qian Liang Cha. Hei Mao Cha will be subject to sorting before further processing. Some sorted grades will be blended to be compressed into bricks. Then the bricks will be sent in the drying room for Fahua (Eurotium cristatumgrowing). 6 Fahua (Eurotium cristatum growing) is the most mysterious processing of Fuzhuan Cha. The bricks will be inoculated with Eurotium cristatum in the drying room. And the drying room need well control of temperature and RH to be adapted with the favorite growing condition of Eurotium cristatum. In the final stage of the processing, RH will be lowered to enough dry the bricks below 6% of moisture content. The whole processing last around three weeks. This is the Fuzhuan Cha product.